Linum Usitatissimum (Linseed) Seed Extract, Melaleuca Alternifolia (Tea Tree) Leaf Oil, Butylene Glycol, Fomes Officinalis (Mushroom) Extract, Salicylic Acid, Ordenone, Saccharomyces/Silicon Ferment, Saccharomyces/Magnesium Ferment, Saccharomyces/Copper Ferment, Saccharomyces/Iron Ferment, Saccharomyces/Zinc Ferment. For problematic skin issues like acne and oiliness. Non-drying, contains tea tree extract, controls oiliness. Comes in the form of a serum which absorbs into skin. watery consistency. Contains minerals which are helpful to the skin. Helped to control my acne breakouts and keep my skin feeling smooth. I dont have anything negative to say about this product. I really like this serum. 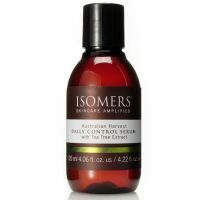 It can be used as a spot treatment or like I use it...all over my face and neck area. A little bit goes a long way. Dont use too much as it will make face sticky. A dime-size amount to a nickel -size amount works well. Last for months. Worth the money.